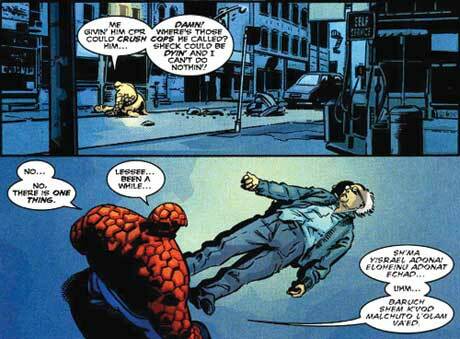 The Thing, created 1961 by Jewish comics greats Stan Lee and Jack Kirby, has in recent years been given a Jewish identity. Perhaps that woman knew that Superman’s Kryptonian name was a very biblical sounding Kal-El, which (when written in Hebrew) means “Voice of God.” The modern comic-book industry has been built on the shoulders of Jewish artists, from Superman creators Jerry Siegel and Joe Shuster to Stan Lee. Anti-Semitism kept Jews out of many mainstream fields in the 1920s and 1930s, said Simcha Weinstein, author of “Up, Up and Oy Vey,” about the Jewish roots and themes of the early comic book industry. Young, aspiring, Jewish artists who found themselves barred from advertising and other artistic industries found their homes in comics, which were still in their infancy and thus had no barriers for Jewish artists. The Jewish origins of Superman and other comic superheroes, however, have been covered in numerous books and articles, including in this newspaper. As fascinating as it is to ponder the correlation between the Incredible Hulk and the Golem of Prague, this is not a history article. It is an article about the present. We know the Jewish roots of comic books; the question we ask is: What is still Jewish about comics? Now, Weinstein said, Jews have become more American and Americans have become more Jewish in their outlook, which has led to an influx of Jewish culture in the media. In comics, this has manifested itself in a number of themes, storylines, and characters that can be seen as overtly Jewish, or based on Jewish ideas. This December, in an issue of “Batman: The Brave and the Bold,” Batman will team up with Ragman, an identifiably Jewish character who gains his powers from a mystical suit of rags, in a Chanukah issue written by Teaneck’s Sholly Fisch. In the issue, Ragman begins to lose faith in himself, but ultimately regains his confidence thanks to Batman, with the help of a local rabbi and the story of Chanukah. Fisch, a regular writer on “Batman: The Brave and the Bold,” has been writing comics for 27 years as his “hobby” while working in children’s television. He bought his first comic book when he was 5 years old back in the 1960s, when Bat-mania was sweeping the country thanks to Adam West’s campy portrayal of the Caped Crusader. He has been writing comics for 27 years for both Marvel and DC on titles such as “Superfriends,” “Scooby Doo,” “Ren & Stimpy,” “Looney Tunes,” and, of course, “Batman: The Brave and the Bold,” based on the Cartoon Network series of the same name. When Fisch decided he wanted to tell a Chanukah story, he went looking through DC’s small gallery of identifiably Jewish characters, and Ragman seemed the ideal choice for a team-up. Danny Fingeroth has been living and breathing comic books since the 1970s and has worked on major titles such as Spider-Man, Daredevil, and Iron Man. In 2007, he penned “Disguised as Clark Kent: Jews, Comics, and the Creation of the Superhero,” exploring the Jewish origins of the superhero genre. Fingeroth credits the likes of Woody Allen and Philip Roth for pushing Jewish sentiments in pop culture, and comic books, he said, simply followed suit. While the original comic creators of the Golden Age were more subtle in their Jewish themes, modern writers have touched on such subjects as the Shoah and Israel, while also using the idea of the mutant as a metaphor for outsiders and Jewishness. Superheroes are a projection of their creators’ and audiences’ fantasies, fears, and hopes, according to Fingeroth, and as such, characters’ Jewish identities have been interwoven in the stories. For example, in recent years the villainous Marvel character Magneto was revealed to be a Jewish Holocaust survivor. The Fantastic Four’s Ben Grimm, a/k/a The Thing, and the X-Men’s Kitty Pryde have also acknowledged their Jewish heritage. As the audience reading comics becomes more diverse, more people look for reflections of themselves in comics, Fingeroth said, and superheroes have traditionally been written to be “everyman” characters. This has resulted in a widening diversity in comic book characters, both in writing and in interpretation. Even characters that are specifically portrayed as Jewish are symbols for misunderstood or oppressed people of all sorts. “Americans, especially people of immigrant backgrounds of any kind, simultaneously want to be Clark Kent – that is they want to be this ultimate gentile and fit into this imagined storybook fairytale America – and on the other hand people do have pride in who they are and where they come from and where their parents come from,” Fingeroth said. Last month, in addition to celebrating Sukkot, Jewish comic-book fans from around the area flocked to New York City for the annual New York Comic Con, the largest comic convention on the East Coast. Fans mixed with comic artists, celebrities, and comic book industry leaders in a celebration of pop culture. In 2009, Weinstein and Fingeroth appeared on a panel with comic-book legend Jerry Robinson, creator of the Joker and co-creator of Robin, to discuss the broad topic of Jews and comics. Contemporary comic greats such as Joe Simon and the late Harvey Pekar were honored during panels at this year’s Comic Con, while such legends as Stan Lee announced new projects and thousands of fans of all ages came dressed in colorful costumes. Teaneck comic writer and artist Neil Kleid took a few minutes away from signing copies of his newest book, “Fraggle Rock,” to talk about his journey through comics, and how he has mixed Judaism into his art. His first graphic novel, “Brownsville,” told the story of Murder Inc., the Depression-era Jewish mob, and focuses on Jewish life in the 1930s. During a time when Kleid was going through his own self-described religious crisis, he wrote “The Big Kahn,” the story of a rabbi who has been keeping a secret from his community for 40 years that finally comes out at his funeral: He was not really Jewish. The story follows the fallout in the community and the impact the revelation had on his family. In one scene after the rabbi’s secret is revealed, the widowed rebbetzin is shopping at a local grocery and runs into people from the community. She walks away, but when she doubles back she finds that the people are looking at the food she had picked up to see whether she is still keeping kosher. When Jerry Siegel and Joe Shuster were creating their tale of a strange visitor from another planet, America was still in the Great Depression and Jews were living in Lower East Side tenement apartments facing extreme challenges blending in to the great melting pot, and even more so in places such as Cleveland, where Siegel and Shuster hailed from. Now, however, he said, it seems like there is an overwhelming need on the part of writers to educate their readers about their own cultures. In contrast to the everyman character that appeals to the broadest audience, Kleid sees a growing number of diverse stories from minority cultures that are capturing the imaginations of the majority. For example, there is “Persepolis,” a French autobiographical comic about author Marjane Satrapi’s childhood in Iran during and after the Islamic Revolution. While DC Comics has drawn the bulk of recent attention for the relaunch of its major titles, Marvel has also been tinkering with some of its heroes. Its “Ultimate Spider-Man” title takes place in an alternate reality and features not white and nerdy Peter Parker as the webslinger, but half-African American, half-Hispanic Miles Morales. The story, Kleid said, goes back to the core of Spider-Man and being an outsider who does not belong – a very Jewish theme, despite the non-Jewish character.